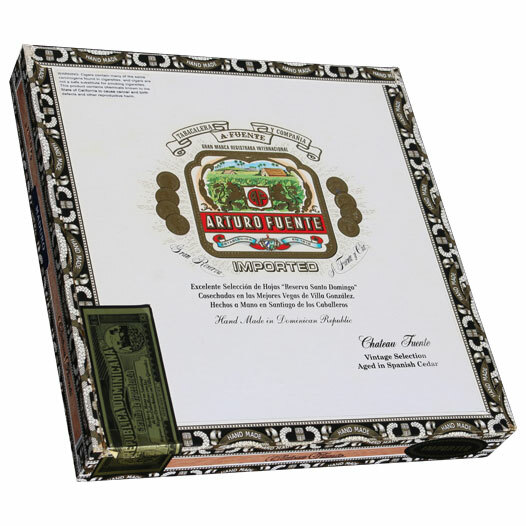 Arturo Fuente Chateau Fuente cigars are named for the family's world-renowned Chateau de la Fuente tobacco farm, located in the Dominican Republic. Before establishing themselves in the DR in the early '80s, the Fuentes had produced cigars in Nicaragua, and had crafted cigars from Cuban tobacco (before the Cuban embargo) in Tampa's Ybor City longer before that. It wasn't long after moving to the DR that the Fuente's purchased their own tobacco farm, with third-generation cigar maker Carlos "Carlito" P. Fuente, Jr. leading development. The pinnacle of Carlito's efforts came in 1995, launching the world's first true Dominican puro—a legendary blend known as Fuente Fuente OpusX. With Arturo Fuente Chateau Fuente, the cigars are based off of similar tobaccos used in the OpusX, which are grown at Chateau de la Fuente. These leaves are patiently aged and incorporated into each cigar's filler and binder recipe. These Dominican blends are wrapped in one of three wrapper styles: Natural (African Cameroon), Maduro (Connecticut Broadleaf), or Shade-Grown (Ecuadorian Connecticut). As a finishing touch, Chateau Fuente cigars are then sealed in the cigar's signature cedar sleeves, adding an additional level of complexity to each lovingly made cigar. Popular sizes in the Chateau Fuente series include the Queen B, King T, and Pyramid, which have consistently earned 90-plus ratings in the industry's top publications over the years. This is an impressive statistic, considering the cigar's surprisingly modest price points.